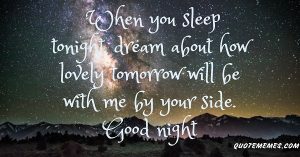 It is bed time, it is the best time to send a sweet goodnight text to him/her to fortify your thoughts in his/her mind as he/she prepares to rest his/her head. Make her/him feel you in every breath of his/her life. Good night my lovely angel. 1. As you lay your head down tonight, so will the good tidings lay waiting for you when you wake by morning. Good night dear. 2. 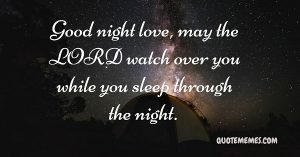 Good night love, may the LORD watch over you while you sleep through the night. 3. GOD grants wishes, I wish that all your expectations will be met and surpassed tomorrow. Have a good night rest. 4. Ignore all your fears tonight. I said a prayer for you and God will take care of them. Tomorrow will always be a better day. 5. Tonight, may you sleep like a baby and be protected from evil fashioned against you. Sweet dreams. Good night love. 6. As you work so hard today, I hope you rest harder tonight so your body and mind be fully fresh for the morning. Good night my sweet heart. 7. I know you can’t get enough of me. But it’s time to go to bed now so you can wake up refreshed for tomorrow. Sleep tight, good night. 8. Sweet dreams love, good night. 9. Sleep like a king/queen that you are. I, your king/queen will be waiting for you in a place called Dreamland. 10. Early to bed, early to rise, sweet dreams to night my sweet love. 11. 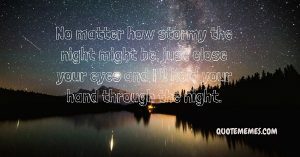 No matter how stormy the night might be, just close your eyes and I’ll hold your hand through the night. 12. The sounds of your deep breath always somehow reassure me that you are having a nice sleep. Sweet dreams dear one, I love you. 13. As you sleep tonight, let my love form a great soft blanket that cuddles and protects you from the night’s cold. Sleep tight. 14. 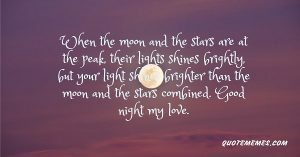 May the light of the moon and illuminate your soul through this wonderful night. Sweetest of dreams love. 15. 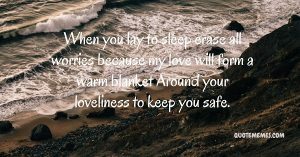 When you lay to sleep erase all worries because my love will form a warm blanket Around your loveliness to keep you safe. 16. When you close your eyes to sleep my sweet angel, don’t be afraid of anything. I’ll be waiting in your dreams. 17. 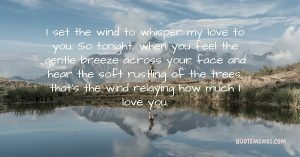 I set the wind to whisper my love to you. So tonight, when you feel the gentle breeze across your face and hear the soft rustling of the trees, that’s the wind relaying how much I love you. 18. You’re my fantasy; my dreams come true. The night is sweetest when you occupy my dreams. 19. The night will play its music tonight. It’ll be sponsored by me. It’ll sing my love and of my affection for the loveliness that is you. You’ll hear my music in your sleep. Sleep tight, my angel. 20. Do not fear the terrors of the night; I’ll be right by your side chasing your demons away. 21. Good night my sweet princess. I’ll be dreaming of you just as I hope you’ll be dreaming of me. 22. My days are beautiful; my nights are lovelier, just because you’re here, right by my side. Sweet dreams my darling. 23. My days are not done until I wish you goodnight and tell you how much I love you. Good night my love. 24. In my heart, you rule as a queen. Your radiance outshines like that of the brightest of stars. Sleep tight. 25. Look at the sky, locate the brightest star. See how it glows? My love for you shines brighter than that. Have a restful night. 26. Here’s wishing my favorite angel a beautiful night’s rest. 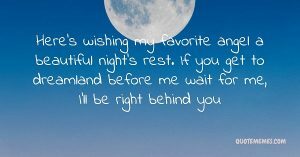 If you get to dreamland before me, wait for me, I’ll be right behind you. 27. Even in the dream, our hearts beat as one, entwined, fused. Nothing can ever come between us. I love you so much. 28. Sleep tight. Dream about us. When you wake, you’ll be in my arms. 29. Nights are for lovers. You’re my one and only love. No one will ever take your place besides in my heart; you are my dear wife and best friend. Good night. 30. You deserve the most restful sleep, my love. You spend your days making me feel so special. I hope this message makes you feel special. Have a beautiful night my darling. 31. Today was beautiful; I enjoy every bit of it with you by my side. I hope tomorrow will be special too. Have a pleasant night. 32. You made my day so lovely. Let’s do it again tomorrow. Sleep tight, my love. 33. I love it when it’s night because I get to forget about my worries and lose myself in your arms. 34. 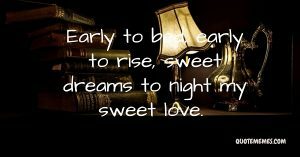 The day’s toil is over, the night whispers in beautiful tones, sleep, and relaxed my love. Tomorrow will be better. 35. 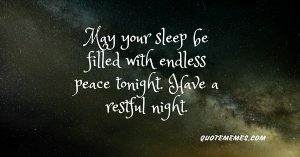 May your sleep be filled with endless peace tonight. Have a restful night. 36. No one deserves a beautiful night more than you, my darling. I pray for just that for you. Good night. 37. The darts of the enemy flying all about will not come close to you. Tonight I’m entrusting you in the arms of the Almighty to keep you safe. Good night. 38. You’re the answers to my prayers, the woman of my dreams. May I not lose you in sleep. May I not lose you at all. Sweet dreams, good night my angel. 39. Sleep well, sleep without fear. I’ve done my due diligence in prayers for you I love you so much. 40. 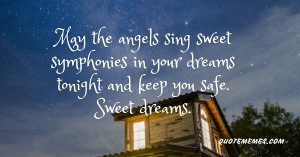 May the angels sing sweet symphonies in your dreams tonight and keep you safe. Sweet dreams. 41. No nightmares, no demons. Tonight you’re getting the sweetest rest ever because I said a prayer for you. Good night my love ever. 42. As you lay to rest, may the Lord keep you safe from the wickedness of the night. Have a blissful sleep. Good night. 43. When you sleep tonight, dream about how lovely tomorrow will be with me by your side. Good night. 44. When the moon and the stars are at the peak, their lights shine brightly, but your light shines brighter than the moon and the stars combined. Good night my love. 45. Every night is beautiful when you’re by my side wrapping me safe in your arms. Good night darling. 46. I just wanted to let you know that I’m at the height of my day when I’m sleeping by your side at night and dreaming of a better tomorrow. 47. I cannot say my day is complete without that lovely goodnight kiss from you. 48. Sleep well my love; I’ll be waiting for you on the other side in the dream world. 49. Your love is a protective covering. Even when I’m asleep, I know I’m safe with you. thank you and do have a pleasant night. 50. My favorite part of the night is when you nuzzle close to me, burying your head in my bosom and holding me as nothing else matters. So I’m looking forward to it again tonight. sweet dreams my love. 51. As you sleep tonight, let my love form a warm blanket around you to keep you safe from the cold. 52. Hey dear. Can you see the shooting star? Well, it’s not. It’s the kiss I’ve just blown to you. Good night. 53. Look at the skies tonight, the shining of the moon is my heart and the glitters of the stars are the feelings I have for you. Sleep tight. 54. 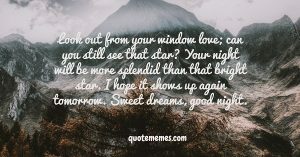 Look out from your window love; can you still see that star? Your night will be more splendid than that bright star. I hope it shows up again tomorrow. Sweet dreams, good night. 55. You are indeed a warrior, a knight in an amour as shiny as the moonlight and as glittery as the stars. Have a good night’s rest peacefully dearest one. 56. Leave your windows open tonight, I’ve just sent you a kiss to go cuddle you while you are asleep. I love you. Good night. 57. There will be a million dreams happening tonight, but there’s only one I care about. That is you, sleep tight. 58. Sometimes I wonder how no one found you before I did. They must have all been blind. I thank GOD I found you first. I’ll never let go, not tonight, not ever. 59. Hey you! Nothing much to say tonight. Just three words; I LOVE YOU. 60. May your tomorrow be better than your today, good night my sweet love. 61. No matter how big your love is, I’ll always find a space to fit it all in. Good night my love. 62. Your love is like my opium. I couldn’t sleep without it until I saw you again tonight. Sweet dreams dear. 63. Have a good night’s rest. For a better tomorrow and the best of blessings forever. 64. I met a fairy last night. It told me some secrets. I’ll tell you all about it tonight. Just close your eyes and think of me. 65. I heard GOD almighty grant wishes. My greatest wish is to be with you in each of the night that comes. 66. Hey! Love. I’m finding it hard to sleep tonight. I think I’ll just go hunting for your love; they’re like treasures. Good night. 67. You are just too precious to my heart, you brought me happiness and good luck, I love you, good night. 68. You make me the envy of others. Think of me while you sleep tonight. I love you dearly. 69. You must be tired from running in my mind all day. 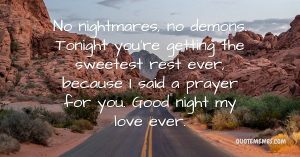 Have a good night’s rest dear. 70. No matter what comes my way, as long as you’re by my side, I will be OK. A million kisses. Good night love. 71. Do you see how bright the moon is? Is how my heart shines for you. Do you see those stars? It’s how many kisses I have for you tonight. Good night love, sweet dreams tonight. 72. Sometimes I wish I was a pillow, so you could hug me all night. Good night my sweet love. 73. Sleep well tonight and listen carefully to your heart. Let it tell you the story of my love. See you at sunrise, good night my sweetheart. 74. You might be thousands of miles away, but you’ll always be in my heart. Good night babe. 75. Let me be on your to-do list for tomorrow dear. I only want to spend some time with you. I love you goodnight. 76. I’ve just laid my bed to sleep and you’re already on my mind. I hope you’ll be there again tomorrow and every other night. Good night my love. 77. Hey dearest, can I be your mirror so you I could get to look at you every night and then? Wishing you a lovely night. 78. If I could travel through dreams as Di Caprio did in Inception, I have only one destination and that you. Good night love. 79. Hey there. I just want to let you know that you’re the only thing that makes sense to me right now. Good night. 80. I knelt down to pray last night and I asked God some questions; what did I ever do to deserve you? How did I ever get so lucky to have you? Good night sweet dreams. 81. I can’t sleep tonight. But don’t worry I’ll keep myself busy, counting down the minutes I get to be with you. I really can’t wait. Goodnight and sweetest of dreams. 82. Hey dear. Just wanted to let you know how amazing you’re. Good night. 83. I’m finding it hard to sleep tonight. Maybe I’ll just think of you. 84. My life seems perfect right now. Guess why? Because I have you in it. 85. I wonder where all the excitements come from when I’m with you and where they disappear to when you’re not here. Have a lovely night. 86. You work so hard and you deserve your night’s rest. Good night dear. 87. Your smile lights up the night skies, not the moon or stars. 88. Will you be busy tonight? Close your eyes let me take you around the world. Don’t worry about the dark. The stars and the moon will be our light, they will lead us through the way. 89. To the world, you’re just one person. To me, you’re the whole world. Good night sweet one. 90. All my life I’ve always guarded my heart to be with an angel like you, and now my heart is fond of you. Sleep a tight, good night. 91. I had a long day. Tonight I’m left with nothing. Nothing but the feeling when I think of you. Good night. 92. Hey dearest, have you ever seen a fairy glow in the dark? Look in the mirror tonight before you go to bed, and you will see how beautiful you are? I love you. 93. I wish I could reach for the stars. I’ll pull them down and well jump on them so we can be taken by it to the highest heaven tonight. You have been the endless joy of my life. Good night love. 94. My day wasn’t bright and my schedule was indeed tight. But I won’t go a day without saying good night. 95. Our love is like the moonlight that lights up the darkest skies. Good night. 96. I was going to tell you good night and sweet dreams, but I realized you’re sweetness itself. 97. Even the darkest and loneliest night turns to harmony anytime I think about you. Sweet dreams. 98. I just realized tonight is going to be a long and cold night without you by my side. Please wrap me with those lovely arms that serve as a blanket for my body, I love it when you touch me. Good night my love. 99. Dreams are like stars, always vast and beautiful. The reason I always have you in mine. Hope to dream of you tonight, good night. 100. Do you know what I truly love most in life? You! Have a good night love. 101. Days and night will come and go. But my love for you will ever grow. Sweet dreams. 102. I always look forward to the nightfall were you quench the thirst in my soul. Have a good night dearest one. 103. As harsh as the sun might be all day, having to cuddle you up at night makes my day better and beautiful. Good night. 104. Do not worry about the future or the past tonight. I’m here for you and my love will forever last. 105. Beautiful in the mornings, pretty at noon and stunning at night. No wonder I can’t let you out of my sight. Good night. 106. Tomorrow, when the sun rises in the east, on you my eyes loves to feast. When the sunset in the west, you make me realize you’re the best. Have a wonderful night! 107. I wish I could be there holding you tight instead of saying Goodnight. 108. My mornings are about thinking how soon the afternoon will arrive. My afternoons are about waiting for the nightfall. All for me to tell you goodnight and I love you. 109. The night looks beautiful. Not because the stars are brighter but because my love for you is stronger. Good night. 110. One day, I wish my dreams would come true and I’d wake up next to you. 111. Right now, it’s cold and lonely in bed without you. I love you. Good night. 112. It is hard to for me to sleep alone on the beautiful bed without you; you make my world a better place, good night. 113. Good night, sleep tight. I’ll be dreaming of you with all my might. 114. I just got out of the shower and my mind starts thinking of you, now I feel lonely without you again. Please come home soon and tonight dream of me sweet one. 115. Last night I had a dream you were lying by my side and I never wanted to wake up. I hope I had the same dream tonight. 116. I can’t wait for tomorrow, to see and touch you. Sweetest of dreams love! 117. Hey love. I’m blowing you a kiss of goodnight. 118. When I go to sleep tonight, I assume you’re my pillow. I hope you do so too. Goodnight beautiful. 119. I am half asleep right now. I found the energy to send you this text. You make my day. Good night. 120. Every night is always the same for me. I go to bed knowing you won’t be by my side. Good night dearest. 121. Guess what. I’ll be dropping by your side to tell you goodnight! 122. Looking at the moon makes me smile. Look out from your window and see it too. We may be two souls apart. But tonight, we see the world together. 123. Every night I try to stay up so you sleep early. All so I’ll send you this text so it is the last thing on your mind before you close your eyes. Good night my lovely angel, I love you. 124. I was never a religious person until I met you. God sent me an angel to prove that some things aren’t just explainable. 125. Quick it’s time to go to bed. The faster you go to bed, the faster we get to see each other by morning. Good night my sweet love. 126. Sweet dreams airlines are boarding. Fasten your seat belt. It’s time to meet your captain-ME! Good night. 127. I just woke up in the middle of the night and I felt something was missing; you by my side. It’s hard falling asleep without you. 128. I always pray for the night to come so that I can curl you in my arms through the night till the morning hour. 129. You make my day beautiful and my night mores blissful, thank God for sending a lovely angel like you to me. I think I’m the luckiest woman in the world to have a charming and lovely husband like you. Good night love, sweet dreams. 130. You are in my mind so much tonight I thought to text you again! Good night. 131. When I sleep at night, you’re the moonlight that creeps into my room. When I wake you’re the sunlight that beams on my face. Indeed you’re the light of my life! I love you so much, good night. 132. Every night while you sleep, an angel sprinkles a little magic dust on you to make you even more beautiful when you wake. 133. I hope it’s not too late to tell you goodnight and that I cherish you more than anything in this world. 134. Bed of clouds for you to sleep. Stars will be your bed lamp. Angels from heaven singing lullabies for you. 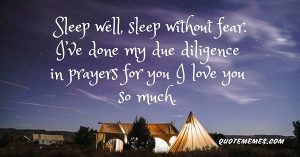 May you sleep peacefully through the night. 135. Good night my dearest one. I pray your night to be peaceful and tomorrow bring you much joy and happiness. 136. Another day is going to end again. A reminder for me that we have each other. 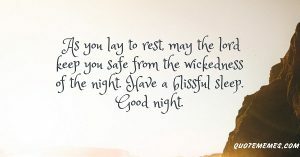 Have a good night’s rest. 137. You certainly don’t make my life perfect, but you indeed make the imperfections easier. Good night angel. 138. Tonight as you sleep, May the angels spread their wings upon you and take you to a wonderland in your dreams. Good night. 139. I wish you a good nights sleep with lots of rest and a sweet dream. Good night. 140. 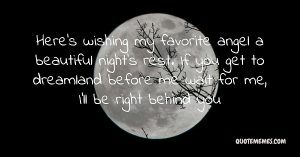 I wish you were here by my side tonight so that we would watch the moon and count the stars. Good night dear. 141. You have changed my life positively, your love blossoms in my heart like the morning flower that is touched by the early morning sun. Have a beautiful night my love. 142. Sleep tight and have a beautiful night, I love you. 143. I’m sending this text because your thoughts are always on my mind and to assure you that I may be far from home but it doesn’t change my deep affection for you. I love you. Good night my angel. 144. 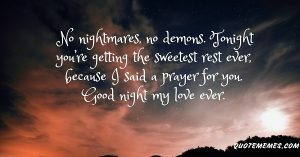 May the LORD protect you from all evils that lurk in the darkness as you rest your head tonight. Good night my love. 145. When the night comes, I’m happy because it is the period when we hold and cuddle each other till we fall asleep peacefully and found ourselves in the beautiful garden of dreamland. Good night my love. 146. I don’t what I can do without you; you make my world beautiful, thank you for loving me and good night. 147. The sweetest of all time are those beautiful nights that we spend together when you are around, I miss you, good night. 148. You are simply irreplaceable; no one can take your place in my heart. Good night love and sweet dreams. 149. I have never been so happy like this before until I met you, you are my superhero, I’ll continue to be sweet love forever. Good night. 150. Good night my most gorgeous lady, sweet dreams. 151. Goodnight my love, see you at the sunrise.